Then on November 9th the team hit Toronto. This was Caplin’s second Toronto Business Breakfast, almost exactly a year after the previous one. This time, rather than competing with Profit & Loss’s Forex Network Canada event on the same day, we joined forces with them and held our breakfast as the first session of the P&L show. We had over 80 people attend. Several people commented later that our session had been the most interesting of the day. Read Paul Caplin’s comments about this session. The Banking Technology Awards 2011 ceremony was held on November 10th in London; Caplin hosted a table and was joined by a contingent from UniCredit – we had jointly made an entry for the Awards in the “Best Trading Venue or Platform” category. Although we were pipped to the Award by RBS (also a Caplin customer), the joint UniCredit/Caplin entry was “Highly Commended” . Here is a list of all the Banking Technology Awards categories, winners and commendations. 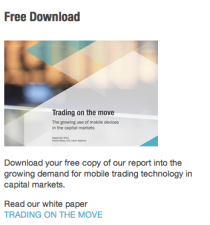 It’s interesting to note that three of the four finalists in this category use Caplin’s Technology to support their trading solutions. The following week saw the Asian team back in action, helped by Patrick Myles, Caplin’s CTO. 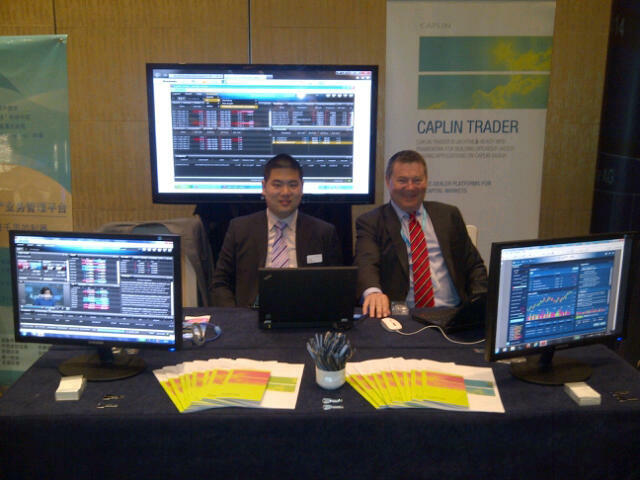 We were in Singapore this time at TradeTech Asia, held over two days – November 16th & 17th at the Grand Hyatt. Patrick took part in two panels on the first day, discussing both the impact of technology on trading and the rise of mobile trading. Back in London less than a week later, Caplin was one of the sponsors of Waters’ European Trading Architecture Summit – held in Canary Wharf on November 22nd. Patrick was again in action, this time supporting the European sales team, presenting a customer case study. This was recorded for posterity; watch the video of “Building a globally deployed single-dealer platform”. And to round off the month, on November 29th Paul Caplin took part in a panel at a networking event discussing the impact of social media on financial services. Although much of the focus was on retail banking and consumer communications there was some interesting discussion about how social media can have an impact on business to business communications. On the same day some of the European sales team attended the FIX Protocol “FPL Spain Briefing” in Madrid. At least it’s now December, and we can take stock and start planning our 2012 event schedule. Keep your eye on the “news” section of Caplin’s website for details of events we’ll be sponsoring next year.